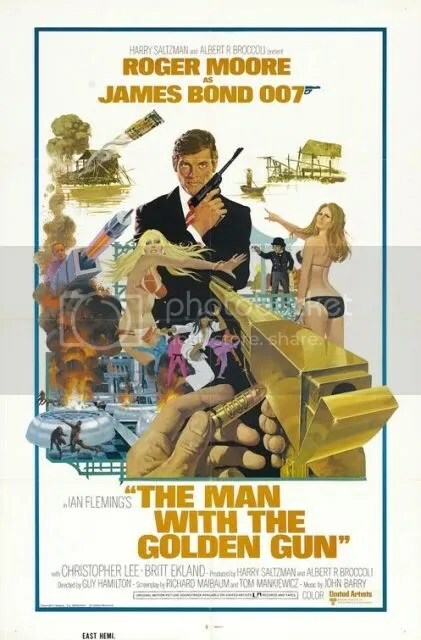 Scaramanga is a hit man (with a golden gun and specially made golden bullets). Bond is drawn towards him throughout the film and it builds up tension very well for a final showdown between the pair. The film doesn’t mess about in showing us Scaramanga we see him straight away in the act of killing someone, and his unusual henchman Nick Nack a midget. I think that certainly adds something a little different to this one. That was not intended to be a pun, but I have just noticed how it sounds ahh! I was obviously looking forward to see how Christopher Lee was in his outing as a Bond villain. I mean we all know that he is a good villain but I was curious to what his character would be like in this one. I thought he was very good, had the creepy sinister edge but with elegance. Having now watched quite a few of the Bond films all in a row I am starting to realise that they aren’t very woman friendly really and is being a Bond girl really the best choice for an actresses career? Yes this may seem a little bit off topic for the review of this film but it was something that was brought to my attention as I thought Britt Ekland as Goodnight put in a very good performance. The character seemed stronger than the other women I have so far seen in the Bond films. She stood up to him and had a good thing going. I mean that changes but at least it had potential. Moore in his second outing seems very comfortable in the role and delivers the lines in a good way as well as carrying the suit off. I am still not feeling him to be amazing looking but he does ooze charm. The story wasn’t too bad with the whole hitman thing going on, and it takes a very long time for Bond and Scaramanga to meet. Obviously a woman is involved and at times it is unclear whose side she is really on. I thought that was quite amusing in all honesty that she was going between both “hero” and villain. Although I know this not something that is so new in the Bond universe. I like that it took ages for them to meet and when they were chasing each other on the island that was a very good scene! A flying car is involved at one point as well! So far I rank this film as being somewhere in the middle, not outstanding but not terrible either. I very much think that is due to Christopher Lee and Herve Villechaize who work well together as an evil paring and really do make things difficult for 007. Completely agree on this one! Average film but Christopher Lee’s amazing! You should be excited for The Spy Who Loved Me though. That one’s just plain old awesome! Definitely one of my faves too.